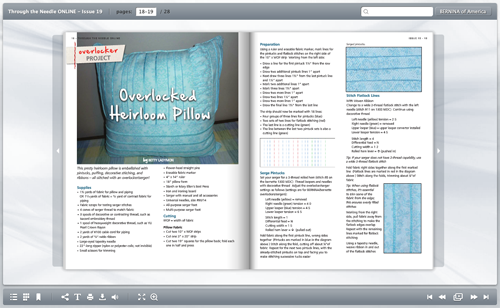 In addition to being part of the WeAllSew team, I’m also editor of BERNINA’s online magazine, Through the Needle Online. 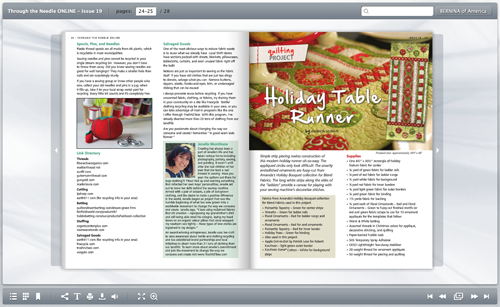 The just-released Issue #19 is full of simple-to-sew projects, all perfect for holiday decorating and gift-giving. 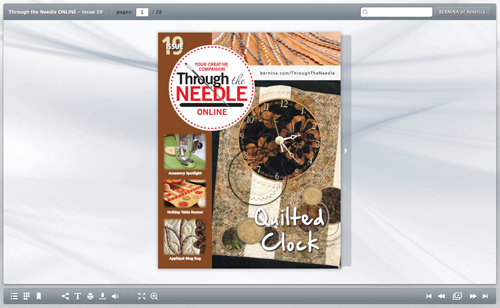 The fabulous quilted clock on the cover is from Kelly Neeley and features appliqued and embellished circles stitched with Circular Embroidery Attachment #83. 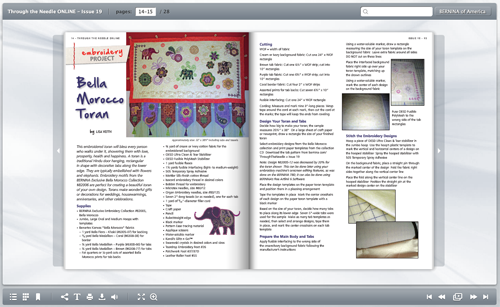 Visit bernina.com/ThroughtheNeedle to download the current issue, available as a PDF file in addition to our Flash-based flip-page magazine. An easy-to-make mug rug from Renae Allen makes a great gift. Brush up on your free-motion stitching skills by making several, each using a different stippling pattern, and give them as gifts. 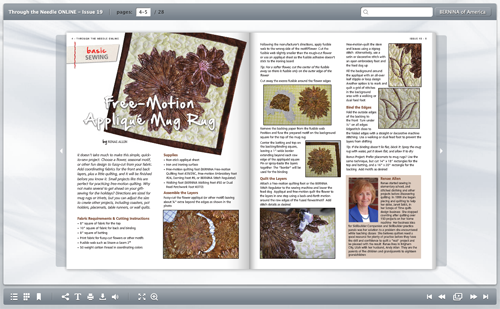 Use the same technique to make potholders, placemats, and wall-hangings. Stephen Weathers’ super-simple technique for digitizing star-like undulating patterns uses only a few mouse clicks to produce stellar results. 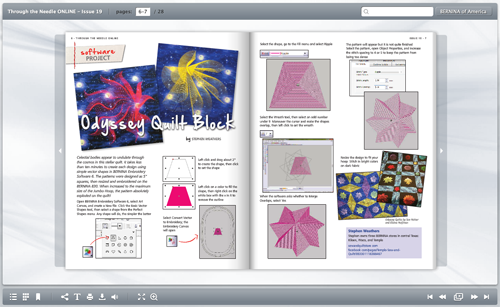 Combine blocks for a stunning quilt. 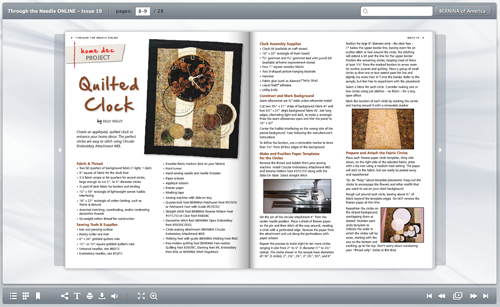 Combining patchwork, applique, and decorative stitching, Kelly Neeley’s quilted clock is sure to bring compliments your way. The perfect circles are a cinch to stitch; just attach Circular Embroidery Attachment #83 to your sewing machine and let it do the steering! Do you avoid sewing button-up because you don’t like sewing on buttons? Let your sewing machine do it for you! Susan Beck shares tips and tricks for attaching buttons with Button Sew-On Foot #18. Welcome guests to your home with a traditional Hindu toran. Designed by Lisa Veith, this embroidered door-hanging features elephants and floral motifs from the Belle Morocco collection #82006. Lovely heirloom stitching isn’t just for Christening gowns and airy dresses. It’s not just for sewing by hand or sewing machine, either! Betty Ladymon’s pretty pillow is stitched entirely by overlocker/serger, from pintucks and puffing to zipper and piping. 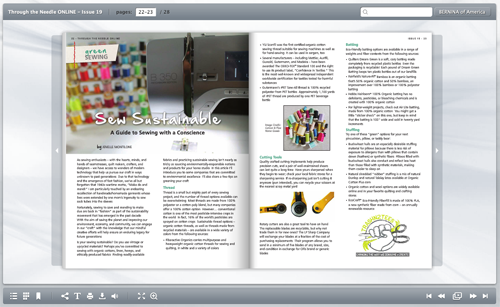 We’d all like to be more “green” in our sewing, but other than re-making garments and recycling fabric, what can we do? Jenelle Montelone shares information on selecting supplies from sustainable resources as well as reusing and recycling instead of sending “trash” to landfills. Amanda Murphy’s Holiday Table Runner only looks complicated. The elegant ornaments are cut from Amanda’s Holiday Bouquet fabric collection; already embellished for you, they only need to be appliqued in place. Note: In the cutting instructions, please cut Ladder fabric into 1-1/2″ strips (not 1/2″ strips). That’s my fault, not Amanda’s. Sorry for the confusion! As always, the back cover includes an accessory coupon in addition to quick links and a peek at what you’ll find in the next issue of Through the Needle Online. 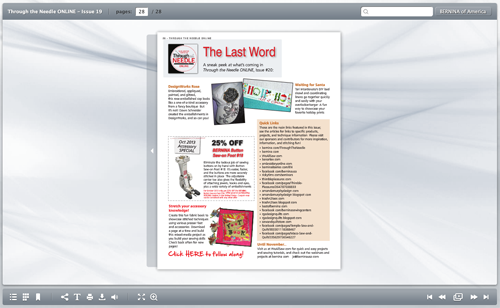 Visit us at bernina.com/ThroughTheNeedle, where you’ll also find an archive of issues #1-18.